Be a volunteer and join in the fun for the 10th Annual HH Food, Wine & Brew Festival to be held September 8, 2018 at the Community Park. 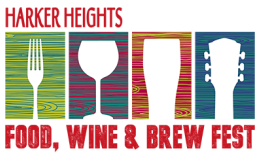 HHFW&B Fest is hosted by the Harker Heights Chamber & Visitors Center. In order for HHFW&B Fest to be a success we must have volunteers. It takes about 125 volunteers to be successful - Come join us and be a part of the excitement! Volunteers work a three and one-half (3.5) hour shift and will be given 1 free admission to the event which includes 5 beverage tasting tickets and 1 t-shirt for their services (required to wear during shift). If you have questions about volunteering please contact the chamber 254-699-4999. Once you have submitted the volunteer form to harkerheights@hhchamber.com the volunteer director will contact you. All volunteers are required to attend an orientation meeting held at the Harker Heights Community Park. You will be notified of orientation meeting and shift schedule as soon as we can.